We know how stressful it can be to bring your kids to a dental appointment, so we work hard to create an inviting atmosphere in our office. Our professional staff members have worked with children for many years and offer a comfortable space for a relaxed dental experience. You will soon realize that by choosing Creek View Dental for your family’s dentistry needs, bringing your children to the dentist does not have to be a stress inducing event! Creating a Healthy Future for Your Children’s Teeth! So many dental problems can be prevented by starting children young with regular dental visits. We welcome the opportunity to provide dental services to ensure your children's teeth are bright and healthy, one tooth at a time. Great dental health starts at home! As a parent, ensure your child has healthy eating habits. Any kind of sugar (natural or otherwise) will mix with germs in your child’s mouth, so be sure to limit the sugar quantity your child consumes each day. Serve healthy snacks as much as possible and be vigilant in what you give your child – even some cough syrups have sugars in them! If you do serve sweets, choose to do so at meals only, when there is more saliva in the mouth to help wash away the sugars. Ensure that your child’s teeth get cleaned daily. Since young children cannot clean their own teeth, it’s important that you do it for them. A good rule of thumb is that once your child can write (not print) their own name, they are ready to tackle brushing their own teeth – under your supervision. Choose a toothbrush that is the right size for your child’s mouth and is soft, with rounded bristles. A new one will need to be purchased every three to four months since children can be hard on toothbrushes. Otherwise, bristles can get worn down and bent. Having a damaged toothbrush will not only prevent an effective brushing job from being completed, but your child’s gums may also get hurt. Healthy Oral Hygiene Starts as a Baby! Even with a baby, it’s important to practice good oral hygiene and we can teach you how! Not only does this start your child off with great dental habits, but it ensures that when they get teeth, their mouth will be a clean environment. We understand how busy families lives get, especially when trying to balance children’s school schedules and activities. That’s why we offer a wide range of convenient appointment times to suit your family’s needs. 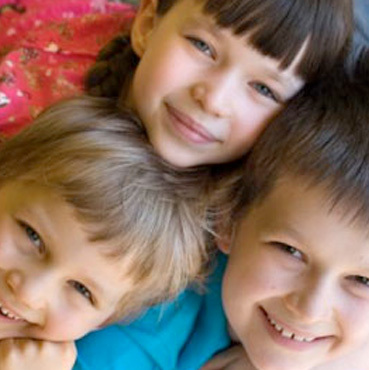 At Creek View Dental, we treat you and your family exactly how we want to be treated. That’s why we are fully invested in your family’s dental health and work hard to ensure there will be many years of healthy smiles. Become a part of the Creek View Dental family – contact us today for an appointment!